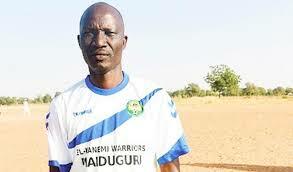 On a day his opposite number on the El-Kanemi Warriors bench, Ladan Bosso accepted his side was inferior, Shooting Stars coach, Fatai Amoo lavished praises on his players and declared that trouble times are over for the Ibadan side. Junior Merenini had struck early in the second half to help Shooting Stars to a slim 1-0 victory over visiting El Kanemi Warriors of Maiduguri in the Match Day 16 game at the Lekan Salami Stadium ,Ibadan. The win lifted the Oluyole Warriors from 15th position to two places up on the log and in his reaction, an elated Fatai Amao told www.npfl.ng that the team has turned the corner. “We are very happy for the three points secured this evening against El Kanemi Warriors which is not a small team by any stretch of the imagination. I watched them beat Abia Warriors in Umuahia so I know that they are good side that is why I prepared my team very well because we were going to play very good side”, Amoo recounted. He attributed some of their past not too impressive results to jitters on the side of the players especially when playing in front of their home crowd. “My young players are a bit tensed when they play at home and we have been working on that moving forward”, Amoo concluded. Shooting showed intent very early in the game to claim all three points with the duo of Ayobami Junior and youngster Sunday Faleye making life difficult for the visitors defense. The all out attacking play yielded dividends as early as the 8th minute when El-Kanemi’s Ehis Kenneth upended Junior Merenini in the box and the referee rightly pointed to the spot for penalty in favour of the home team. Teenage sensation Sunday Faleye could not beat Goalkeeper George Michael who dived to his left to make a fine save. The score would have been different in the first half if the the home team had converted the chances they created. Faleye was the biggest culprit as he failed to convert the chances that were carved out on several occasions. On resumption after the break,3SC were the quicker off the mark as a sweet team play which started with Man of the Match Ayobami Junior and Tolulope Alaifa from their half of the field into the visitors box was not properly cleared as the Warriors defenders were in sixes and sevens. The ball fell kindly for Merenini whose low drive beat George Michael for what would turn out the only goal of the match. The home team almost doubled the lead on the 51st minute when a long range effort from Babalola Ibrahim came off the visitors post. The introduction of Asiri Emmanuel in the second half proved an inspired substitution as his constant attacking play gave the visitors some more worries. The trio of Isiaka Olawale,Samuel Mathias and Babangida Ibrahim for El Kanemi found the going difficult as the home team held out for a famous win in Ibadan.